Whether they’re real or imagined, screen villains all have to have one common factor: a belief that they’re right. Almost no one goes around trying to be evil. A truly memorable bad guy at least thinks they’re doing the right thing, even if they know their methods aren’t exactly legit. 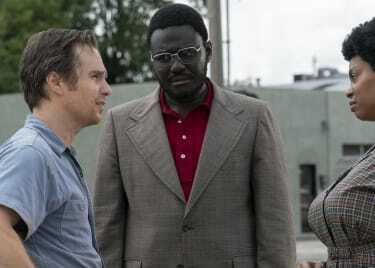 Sam Rockwell is insanely good at projecting that belief. In THE BEST OF ENEMIES, Rockwell plays a very real villain: C.P. Ellis, a KKK leader who staunchly opposed desegregation in schools throughout the 1960s. Without making light of the real events depicted in the film, we’re excited to see Rockwell apply his proven skills to the true story. With his cocky grin and swagger, Rockwell projects pure confidence. This has served him well since the very beginning of his career, in films like TEENAGE MUTANT NINJA TURTLES. One of the actor’s earliest roles aligned him with the evil Shredder. Rockwell may have played little more than a nameless thug (excuse us, “Head Thug,” per the credits), but he came off as a guy who took care of number one before anything else. Years later, he pushed that same unshakable belief in himself as far as it could go, in sci-fi comedy THE HITCHHIKER’S GUIDE TO THE GALAXY. Rockwell plays Zaphod Beeblebrox, the President of the Galaxy who steals a high-tech ship in order to uncover the biggest secret in the universe. Zaphod cannot even conceive of the idea that he’s anything other than the greatest being in existence. With Rockwell in the role, it’s easy to be charmed into thinking he might be right — even though the truth is very obviously not on his side. 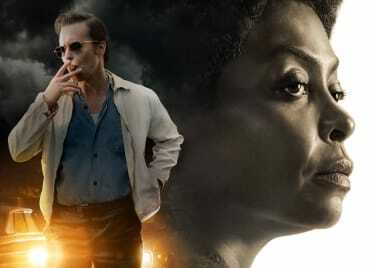 One of the biggest roles on the actor’s resume is Justin Hammer, the Marvel Cinematic Universe industrialist who tries to beat Tony Stark at his own game in IRON MAN 2. Few would argue that this movie is at the top of the MCU heap, but it does show off the vulnerability Rockwell can inject into even the most grandiose character. Justin Hammer wears expensive suits, flies on private jets, and has ice cream brought in from thousands of miles away so that he can enjoy dessert before lunch. While Hammer is smart and cunning and ruthless, above all else he is incredibly insecure. He wants to be Tony Stark and knows he never will be — and Sam Rockwell allows us to see that in every scene. He plays the role big, but not in a scenery-chewing way. Hammer covers his self-doubt with lavish spending and big gestures. We can see it’s all a sham, because Rockwell exudes a constant clash between Hammer’s put-on assertiveness and the uncertainty it covers. While he’s better than almost anyone else at chewing up big villain roles (think of his serial killer character in THE GREEN MILE), lately Rockwell has been going more realistic. In doing so, he’s adding even more nuance to his personal rogues gallery. The same mix of self-assurance and insecurity from IRON MAN 2 may be what Adam McKay was looking for when he hired Rockwell to play George W. Bush in VICE. Bush isn’t a villain, but for the sake of the film’s perspective, he might not be a hero either. In Rockwell’s hands, the former President is likable and quite charming. Then, there’s THREE BILLBOARDS OUTSIDE EBBING, MISSOURI, for which Rockwell won the Best Supporting Actor Oscar®. He played Jason Dixon, a racist, alcoholic small-town cop who has no qualms about throwing his weight around to intimidate those less powerful than he is. Dixon is made to see how his beliefs are wrong and his behavior has held him back, and he changes … at least a little. Rockwell is menacing and even scary at the outset, but he plays weakness as a core part of Dixon’s personality from the beginning. When he starts to change, we get to see it as strength. Since THE BEST OF ENEMIES walks some similar ground, we’re curious to see how Rockwell applies his proven skills to a true story. 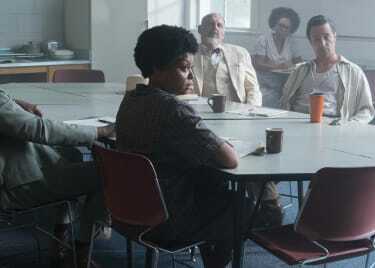 Taraji P. Henson stars in the film as Ann Atwater, a Durham civil rights activist opposed to Rockwell’s character. The material is challenging, but there aren’t any actors we’d rather see bring it to life. 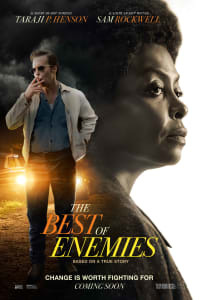 THE BEST OF ENEMIES opens on April 5.